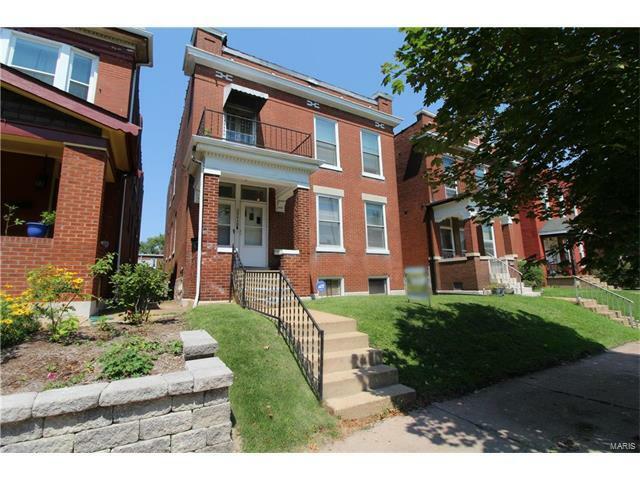 Opportunity knocks with this spacious duplex in the Tower Grove East Neighborhood. Both units feature a living room (1st fl has a woodburning fireplace), dining room, eat-in kitchen, walk in pantry, original built-in cabinets, full bathroom, and LOTS of closet space. The 1st-floor unit has 2 bedrooms plus a bonus room that is currently being used as a large, walk-in closet. The 2nd-floor has 3 bedrooms plus a large bonus room as well as a front balcony. The backyard features green space, a patio, and even a fruiting, pear tree. There is also a 2-car concrete pad for off-street parking. The property has been well cared for and is in fair to good condition. Everything that is there is functional but it could use some sprucing up. This is a great opportunity for those looking to get in this awesome neighborhood and be able to create their own sweat-equity. The 1st floor unit is vacant and the 2nd-floor tenant pays $800. Seller prefers to sell in As Is condition. From 64/40 or 44, head south on Grand Ave. Turn left (east) on Wyoming. Property will be on your left.